Munster Lucozade Sports Junior Cup 5th round: Pike Rovers 5 Wilton Utd 0; Leeside 1 Kildimo 0. Murphy’s Irish Stout AOH Cup 3rd round: Glanworth Utd 2 Churchvilla 3. Murphy’s Irish Stout Saxone Cup 2nd round: Hibernians’ “A” 4 Central Rovers 1. President’s Cup quarter finals: CFC Banteer 1 Afton Villa 2; Macroom “B” 0 Brooklodge Utd 1; UCC “B” 1 Strand Utd 3; Grattan Utd “B” 3 Carrigtwohill Utd “B” 1. City Cup 2nd round: Blackpool Cel 3 Casement Cel 2 (aet). County Cup 3rd round: Passage 2 Springfield “A” 1. Ballyvolane 1 Castleview 1; Greenwood 3 Leeds 2. League 1: Ballintotis 4 Richmond 2; Dunbar Cel 2 Killumney Utd 2; Grangevale 1 Leeside 2; UCC 0 St John Boscos 1; Watergrasshill Utd 2 Shandon Cel 7. League 1A: Bohemians 2 Park Utd 0; Donoughmore Ath 0 Ballyvolane 0; Mayfield Utd 5 Rylane Cel 1; Glen Cel 2 Fairview 4. League 2: Wilton Utd 1 Glenvale 2; Innishvilla 5 Ard-na-Laoi 0; Kinsale 2 Lakewood Ath 0. League 2A: Killowen 2 Waterloo 4; Castle Cel 2 Coachford B 1; Inter City Cel 4 Hillington 4. League 2B: Carrigaline Utd 3 Cathedral Cel 2; Knocknaheeny Cel 1 Knockraha 3. League 3: Leeside 8 Hibernians 1; Greenwood 2 St John Boscos 1; De Courcy Albion 4 Parkview Cel 3. DISC-Viking U17 Teddy Healy Cup second round: Carrigaline United 3 Castleview 4. FAI Umbro Youth Cup fifth round: Mervue United v Cork City postponed. Avondale United 1 Cobh Ramblers 1, Castleview walkover from Leeside/Knockraha, Douglas Hall 4 Rockmount 1, Everton 1 Fermoy 4, Greenwood 1 Carrigaline United 2. Daly Industrial Supplies-Stihl Youth League 1: Carrigaline United B 1 Innishvilla 3, Lakewood Athletic 2 Ballincollig 1, Midleton 5 Ringmahon Rangers 0, Passage 1 Park United 3. FAI Umbro U17 Cup fourth round: South End United 5 Kilreen Celtic 1. DISC-Viking U17 Teddy Healy Cup quarter-final: Castleview v Greenwood postponed. DISC-Viking U17 Premier League: College Corinthians A 7 Glounthaune United 1, Cork City v Avondale United postponed. DISC-Viking U17 League 1: Ballincollig 3 Buttevant 1, College Corinthians B 2 Rockmount 2, Everton 1 Mallow United 3, Leeside/Knockraha walkover from Lakewood Athletic, Tramore Athletic 3 Coachford/Killinardrish 1, Youghal United 0 Leeds 3. Pat O’Connell fired in a four-timer as Mayfield Utd scored a 5-1 win over Rylane Celtic in the AUL first division today. Homesters Mayfield led 3-1 at the break, thanks largely to a brace by O’Connell. Unlucky Rylane piled on the pressure for much of the second half but O’Connell broke their hearts with his third about the 75th minute and then he made sure when scoring again as then final whistle approached. On the adjacent all weather pitch, Mayfield’s other junior side defeated Brooklodge 3-1 in an MSL game. As per earlier notification, the Management Committee has already made a decision to refuse granting any free weekends to all clubs for the unforeseeable future. This decision was taken as a result of the enormous backlog of fixtures that have built up due to the inclement weather experienced over the last number of months which was responsible for a significant amount of games being cancelled. Kilreen Cel v Carrigtohill Utd "A"
Leeside "B" v Rathcoole Rovers "A"
Carrigtohill Utd "A" v Leeside "B"
2 Ballintotis v Wilton Utd "B"
6 Carrigaline Utd v Leeside "C"
7 Coachford "B"v Greenwood "B"
WINNERS 3 v Ballyvolane "B"
Grangevale v Dunbar Cel "B"
Corkbeg v St John Boscos "B"
Watergrasshill Utd "B" v Park Utd "B"
Mayfield Utd v Springfield "B"
WINNERS 2 v Carrigtohill Utd "A"
The next Aviva Club of the Month closing date is fast approaching. For your chance to join Kingscourt Harps (Cavan) and Blessington FC (Wicklow) as a recipient of this prestigious award, then please follow this link http://www.fai.ie/ and simply fill out the form in the "Domestic and Grassroot" section. Aviva Club of the Month The closing date for this month’s applications is Friday February 26th. Each winner will receive a cash prize of 1,500 euro and will be invited to take part in the Aviva Club of the Year competition which will take place in Wexford next August as part of the FAI AGM and Festival of Football. Can all Premier and Premier A teams please send a list of scorers in the league to Martin Conlon so that he can check them against the cards. Please e-mail the information to the following address:conlonmartin@eircom.net. 5th Prize: €70 Voucher for Actionpak Paintball6th Prize: €50 Hair Salon Voucher. Draw takes place on Sunday 28th March. Contact - decourceyalbion@gmail.com for more. Best wishes and a speedy recovery to Glenvale's Dave Yelverton who sustained a serious injury while in action for this club on Sunday. Munster Lucozade Sport Cup quarter-final: South End United 2 Cork City 3. Daly Industrial Supplies-Stihl Murphy Cup second round: Rockmount 0 Carrigaline Utd A 4, Innishvilla 3 Castleview 4. Daly Industrial Supplies-Stihl Premier Youth League: Cobh Ramblers 7 Everton 1, Fermoy 3 Douglas Hall 2, Leeside/Knockraha 0 Greenwood 3. Daly Industrial Supplies-Stihl Youth League 1: Passage 4 Lakewood Athletic 2, Ballincollig 3 Ringmahon Rangers 2, Midleton 1 Park United 0, Kanturk 2 Ballyvolane 1. DISC-Viking U17 Teddy Healy Cup quarter-final: College Corinthians A 6 Mallow United 1. DISC-Viking U17 Teddy Healy Cup quarter-final: Kilreen Celtic 3 Avondale United 1, Leeside/Knockraha 2 Glounthaune United 1. DISC-Viking U17 Premier League: Greenwood 3 Castleview 1. DISC-Viking U17 League 1: Everton 4 Ballincollig 2, Coachford/Killinardrish 4 Youghal United 1, Lakewood Athletic 6 Buttevant 2, Leeds 2 College Corinthians B 0, Rockmount 1 Tramore Athletic 1. FAI Umbro Junior Cup 6th round: Wilton Utd 0 Ballynanty Rovers 1; Springfield A v Carbury (Springfield advance after getting a walk-over. ); Leeside 1 Freebooters 0. Murphy’s Irish Stout AOH Cup 2nd round: Crescent Ath 1 Churchvilla 4. Murphy’s Irish Stout AOH Cup 3rd round: Passage 0 Greenwood “A” 2. Murphy’s Irish Stout Saxone Cup 1st round: Killowen 1 Casement Cel 2. Mayfield Utd 4 Dunbar Cel “A” 2; Lakewood Ath 2 Wilton Utd “B” 2 (Wilton won 4-3 on pens aet); Douglas Hall 3 Inter City Cel 0; City Wanderers 2 Kilreen Cel 9; Dillon’s Cross Ath 6 Greenwood “B” 2; Glenvale 1 Bohemians 1 (Bohs won 9-8 on pens aet). Murphy’s Irish Stout County Cup 1st round: Hibernians’ B 4 St John Boscos “A” 5; Springfield “B” 3 Ballinhassig 3 (Springfield won 4-3 aet). County Cup 2nd round: Buttevant 1 Richmond 1 (Richmond won 4-3 aet). Killumney Utd 7 Carrigaline Utd 1; Millstreet Cel 6 Watergrasshill Utd “A” 3. Premier A: Greenmount Rangers 0 Blackstone Rovers 0; Pearse Cel 3 Kanturk 1; Ballyvolane 4 Macroom 3; Castleview 0 Leeds 1. League 1: Carrigtwohill Utd 5 UCC 1; Postal Cel 4 Shandon Cel 0; Grangevale 5 Ballintotis 1. League 1A: Rathcoole Rovers 1 Fairview 1; Glen Cel 3 Rylane Cel 0; Park Utd 1 Donoughmore Ath 3. League 2: Ard-na-Laoi 3 Blackpool Cel 4; Kinsale 0 Hibernians 2. League 2A: Glanworth Utd 2 Coachford 0; Hillington 1 Castle Cel 1. League 2B: Knockraha 3Leeview 0; Knocknaheeny Cel 0 Corkbeg 4. League 3: Dunbar Cel 2 Parkview Cel 1; Leeside 0 Afton Villa 3; Brooklodge Utd 4 UCC 0; St John Boscos 2 Carrigtwohill Utd 1. League 3A: Grattan Utd 5 Los Zarcos 4; Strand Utd 2 CFC Banteer 4; Watergrasshill Utd 0 Rathcoole Rvs 4. Please e-mail the information to the following address: conlonmartin@eircom.net. Alex Coughlan and John Paul Morrissey who got Casement Celtic's goals in their 2-1 win over Killowen in the 2nd round of the Saxone Cup this afternoon. All results - now in. Premier A: Greenmount Rangers 0 Blackstone Rovers 0; Pearse Cel 3 Kanturk 1; Ballyvolane 4 Macroom 3. The FAI 6th Round Cup game between Springfield and Carbury scheduled for Sunday morning has been cancelled. Games to be played on or before 20th / 21st March 2010.
are looking for a challenge game on either next Saturday OR Sunday. Anyone interested, please contact James Lahive at 087-1322499. A lot of people are enquiring about next week's fixtures. Unfortunately, I have not receive them yet. Once I get them, I will waste no time at all in posting them on the Blog. There is also a lot of interest in the various cup draws - especially local. Again, the same applies here - if I get any info on these events, I will post them right away. Neil McSorley’s Grange continued their good run in AUL 1 with a hard earned 2-1 away win over Shandon Celtic. Scores via an o.g. and a Chicken McSorley penalty had the winners two up at the break. James McCarthy pulled one back immediately after the break and Mark Forde’s Shandon piled on the pressure in the third quarter. Each side had chances in the final quarter but no more goals and Grange held on for all three points. Great to meet Grange stalwarts Donie and Dave and best wishes for a speedy recovery to Dave’s Bernie who missed the win due to the flu. 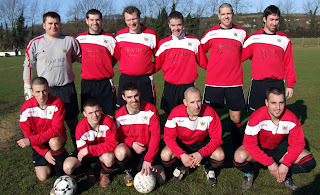 Munster Lucozade Sport Junior Cup 4th round: Wilton Utd 4 Postal Cel 1; Waterloo 1 Janesboro 1 (Janesboro won 4-1 aet). Result from O'Sullivan Park last night. James Green Ian Foley (two), Niall Calnan. The home team must contact their opponents to ensure there is no clash of colours and to make arrangements to meet them in order to ensure they will be able to locate match venue. These new permanent anti vandal sports buildings with a 60 year life design are completed on site in 3 weeks. All GAA requirements are incorporated in the design of the buildings and contain all requirements for disabled access and health and Safety requirements. Please contact Neal Murphy on 087 1327692 to discuss your project or arrange to visit our existing buildings. The Suresport anti vandal product is endorsed and has been tested by the Independent Board of Agrement Building System which independently assesses the product to have a 60 year design life, the same as conventional build. · Costs – Allspace can supply a fixed price contract to ensure delivery of the project within your budgets. · Design – The building can be designed by the client to meet individual needs or any licensing or health and safety needs. · Additions – Extra modules or a second or third storey can be added onto the building as clubs require additional space. Suresport anti vandal product as a highly durable and anti vandal product is ideally suited to any facility, which can be isolated and left unattended for large portions of the week. In addition maintenance costs are minimal given the highly durable nature of the interior of the building. The attached brochure explains in detail. Suresport anti vandal product will enable your club to meet tight time schedules. A standard sized building is available within eight to ten weeks of order. CHANGES IN FIXTURES FOR NEXT WEEKEND. Murphy’s Irish Stout 2B: Central Rovers v Carrigaline Utd Central Pk Eddie Mullins. Saxone Cup 1st round: Springfield “B” v Crescent Ath Pat O’Brien Pk Denis Daly. Daly Industrial Supplies-Stihl Premier Youth League: Avondale United 1 Fermoy 2, Cobh Ramblers 1 Cork City 4, Everton 1 Carrigaline United 8, Leeside/Knockraha 0 Douglas Hall 4, Richmond v Rockmount, Castleview v Greenwood both postponed. Daly Industrial Supplies-Stihl Youth League1: Ballincollig 0 Innishvilla 2, Ballyvolane 3 Passage 1, Kanturk 2 Lakewood Athletic 1, Midleton v Park United postponed. FAI Umbro U17 Cup fourth round: St Francis 2 Carrigaline United 2 (Carrigaline United win 3-0 on penalties). DISC-Viking U17 Teddy Healy Cup second round: College Corinthians B 2 Avondale United 4, Coacford/Killinardrish 0 Kilreen Celtic 5, Ballincollig 0 College Corinthians A 8, Buttevant 3 Greenwood 8, Leeside/Knockraha 2 Rockmount 1 (aet), Tramore Athletic 1 Glounthaune United 5, Mallow United v Cork City postponed. DISC-Viking U17 League 1: Lakewood Athletic 3 Youghal United 3, Everton 2 Leeds 2. Martin Conlon so that he can check them against the cards. FAI Umbro Cup 5th round: Leeside 5 Cabinteely 1. Sunday 7th February kick off 10-45 unless stated. Munster Lucozade Sport Junior Cup 4th round: Killumney Utd 1 Regional Utd 3; Villa FC 3 Grangevale 0. 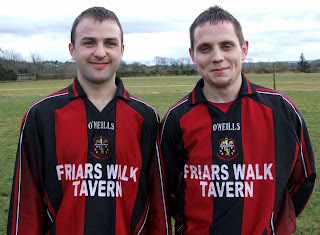 AOH Cup 3rd round: Dillon’s Cross Ath 1 Knockraha 1 (Dillon’s Cross won 5-4 on pens aet). Murphy’s Irish Stout St. Michael’s Cup 2nd round: Watergrasshill Utd 1 Leeside 3. Murphy’s Irish Stout Saxone Cup 2nd round: Kinsale 0 Glenvale 2; Blackpool Cel 3 Lakewood Ath 1. Murphy’s Irish Stout City Cup 1st round: Casement Cel 3 Knocknaheeny Cel 1; Dunbar Cel “A” 4 Cathedral Cel 4 (Dunbar won 4-2 on pens aet). Murphy’s Irish Premier League: Knockavilla Cel 1 Wilton Utd 2. Premier A: Ballyvolane 2 Blackstone Rovers 2; Greenwood 3 Pearse Cel 2; Leeds 1 v Kanturk 4. League 1A: Rylane Cel 1 Ballyvolane 2. League 2: Hibernians 0 Innishvilla 2; Wilton Utd 2 Ard-na-Laoi 0. League 2A: Coachford 1 Castle Cel 0; Inter City Cel 4 Killowen 1; Millstreet Cel 0 Waterloo 1. De Courcy Albion 0 Leeside 4. The Leeside team that had a convincing 5-1 win over Cabinteely in the FAI Junior Cup to reach the last 32 at Leeside Park to-day. Freebooters of Kilkenny are next up for Leeside after the Little Islanders hammered a poor Cabinteely Utd outfit 5-1 in the FAI Junior Cup. Ricky Gettings (right, in photo) had the winners one up at the break and Derek Delea had seen a first half free come back off the bar. The Dubliners looked decent for a spell after the break but two Leeside goals (by Delea and Johnny Barrett) and a sending off meant the contest was over. A tiring Cabinteely had two more sent off as Leeside stretched it to 5-0, Delea (pen.) and Gettings on target. The losers got their consolation from a late penalty. Leeside will again have home advantage. From his schoolboy days with St Mary's, Jerry Geaney was earmarked as a player to note. He didn't receive as much exposure as Tower or Glasheen players but he availed of his limited opportunities on the bigger stage. In 1950 he was outstanding for the Mary's U16 team that was defeated 1-0 by Tower in the cup final at Turner's Cross. A few weeks later he scored the goal that earned Munster a draw against Leinster at the Mardyke. The return was played in Home Farm and Jerry went into many notebooks after another starring performance in a 2-2 draw. 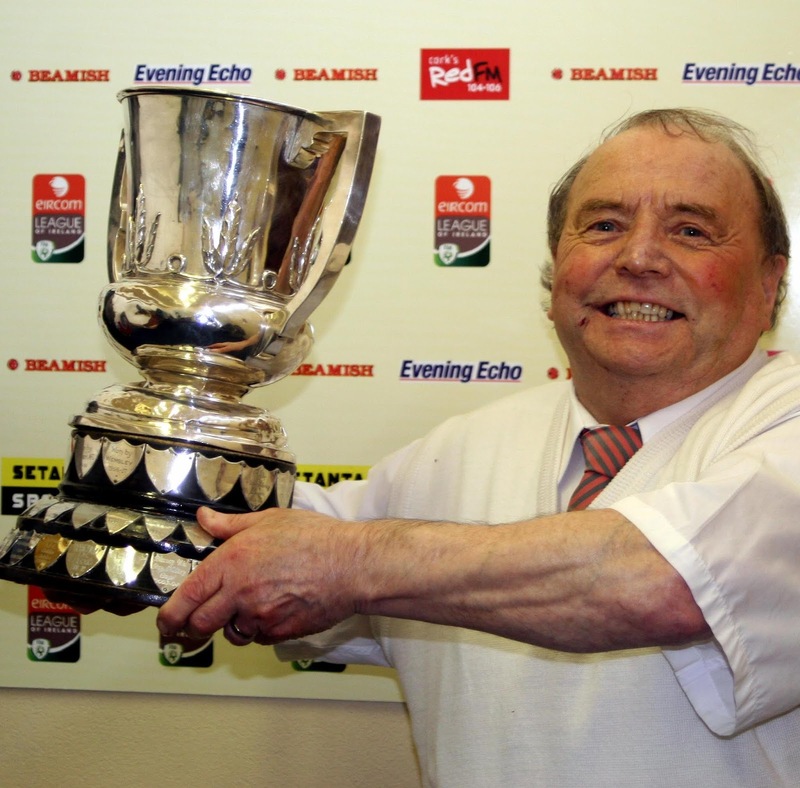 Jerry won the first of many honours when helping St Mary's to the Munster Minor League title in 1951 and was once more recognized by local selectors who chose him on the Cork Selected Minor X1. Cork Athletic offered him terms and in the middle of the Carter season of 1953 he joined the League of Ireland club. Opportunities were limited at the Mardyke and Jerry returned to St Mary's. When St Mary's joined the AUL in 1956 he was selected on their Inter League team for an annual challenge against the Dublin AUL. One year later he gained a coveted AOH Cup medal when helping the Saints to a dramatic victory over Fermoy. Throughout the following decade his playing career continued with St Mary's and when rebuilding commenced he stepped down to assist the reserve side. In Inter House football he played with Goulding's and with them he suffered a career ending injury when he broke his leg in Blackpool Park. 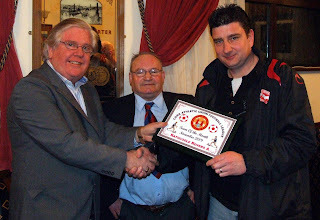 Jerry was enrolled as an Honorary Life member of St Mary's in recognition of devoted service to the club. He was team manager on several occasions and his successes with Mary's led to his appointment in a similar capacity with the Cork AUL's Oscar Traynor Inter League side, a position he held on two occasions. Jerry did his football business, with officials and referees, with a smile, often cracking the ice with a joke, before putting forward his question on behalf of his club or his players. He will be remembered throughout the city and isn't it appropriate that his last resting place will be at Kilcully, just a kick of a ball away from St Mary's Park. It is with great sadness that we learn of the untimely death of Gerry Geaney yesterday evening. He will be fondly remembered and sadly missed by everyone in football. The league, its clubs and players, extend condolences to his family, friends and colleagues at this difficult time. The league would like to request all referees on duty this coming weekend to precede your games with one minute silence as a mark of respect. ( see attached) . As previously committed we will send the monies to the League and to a charity of Paddy’s family choice at the appropriate time. I hope we get a good turnout for what promises to be a good contest and the match will be one Paddy would be proud of. League 2B: Springfield B V Carrigtwohill. League 3A: Los Zarcos V Strand. KILLUMNEY UNITED V REGIONAL UNITED 4th Round MJC. This game is now switched to the the CIT Grounds, Rossa Avenue (kick-off 2pm). This is a huge game for Killumney United AFC and the club would ppreciate all the support they can get for what promises to be a great encounter. On behalf of the league, I would like to wish Killumney the very best of luck on Sunday. Rathcoole's players and supporters at the November team of the month awards night at the Sandpit Bar last Monday night. Dan Reidy, Murphy's Irish Stout presents the November team of the month to Paul Brophy (Manager of Rathcoole A) watched by Henry Healy (Registrar AUL) at the Sandpit Bar in Rathcoole last Monday Night. betweent Cork AUL and Cork City as the pitch is unplayable. There will be a Disciplinary meeting at Turner's Cross on Wednesday at 7pm sharp. Would you like to try one of the most amazing walks you will ever do in Ireland. And help Street Kids in Africa along the way! To undertake this climb I must raise €5000. The ridge of Caher returning from Corrán Tuathail and the Sea of Cloud Below the last approach. What I am looking for is 20 people to do the walk, and all I want is for those 20 to raise a minimum of €150 in sponsorship. I will get you to the summit along with other Guides who have done this walk before with me on many occasions. It is not a very difficult walk and the feeling of achievement at the top is amazing. DO YOU HAVE THE STAMINA/BALLS??? Give me a Shout and please help the Street Kids along the way! Anyone got club, team presentation photos you'd like to see on the net. Send them on to cork.billy@gmail.com and we'll put them up for you. There will be a Disciplinary meeting at Turner's Cross tomorrow night (Wednesday) at 7pm sharp.